Saturday 8th October 2016 – The 37th Brian Wilson/Beach Boys Convention. Struggle as we may and to be honest we do try very hard to abide by your wishes. We have had to again alter the date from the one which was given out at the 36th event last October. This is due to the request of Mr. Mark Linett who was not able to confirm a date in September due to his free-lance commitments. Mr Alan Boyd was happy to attend on any date between September 1st and the 31st October. It would always be our intention to seek the third September Saturday, as was requested by those present in 2011, however, this may not always prove possible. Date;- Saturday 8th October 2016. As many of you will be aware this change of date was placed on the web-site, on or around the 15th of December. Thus we hope most of all of you are now aware of this. Come 2017 we will endeavour to secure the third September Saturday, which is in fact the 16th however should this not prove possible, we seek your kind understanding. Tickets;- There has been a significant alteration to the ticket design layout and it will interesting if you can spot the differences. The previous one had been in use for some twenty years and we are very grateful to Darren at Riverprint for his help with this, as we were unable to locate my original ‘paste-up’ for this. At the time of writing there may just be one further small modification and then we can sign off the proof copy and hopefully we should receive the tickets in some 14 days or so. 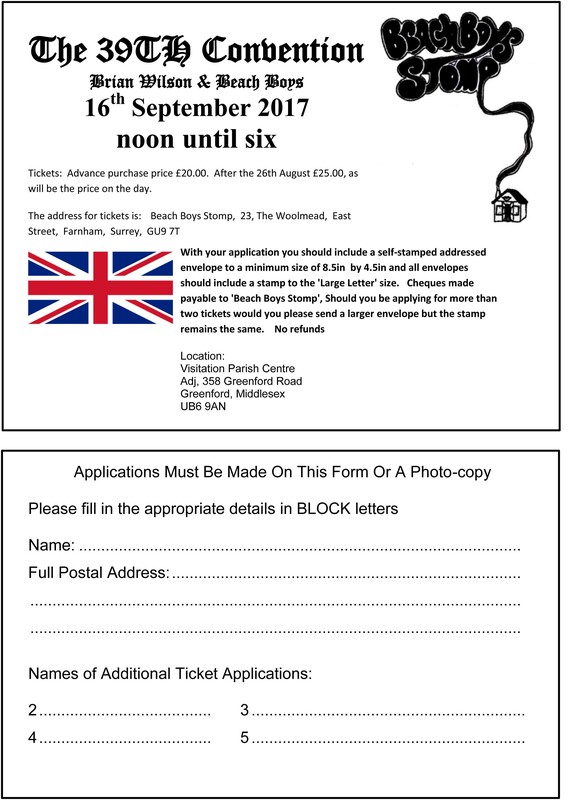 Tickets are £20-00 per person with cheques payable to ‘Beach Boys Stomp’ and posted with a ‘LARGE LETTER’ stamp on the minimum sized 8.5″ x 4.5″ S.A.E. There has been a slight alteration to the design of the badge and this past year we had to uprate a number of stamp rates to accommodate this. As is usual the address for tickets is ‘Beach Boys Stomp’ 23, The Woolmead, East Street, Farnham, Surrey, GU9 7TT. Entry;- The doors open at 11 o’clock for a full hours warm up to the commencement of the days events at a prompt 12 noon. With hopefully a 6 o’clock finish but certainly no later. Location;- The full address is;- The Visitation Parish Centre, adj. 358, Greenford Road, Greenford, Middlesex, UB6 9AN. It is within the area of the ‘Cardinal Wiseman R/C School. As has been promised previously we will endeavour to print a map of the actual location but when we have used the item which was in the magazine for many years, in computer digital format it just disappears. We are not convinced about Google maps so we will see what we can come up with? Accommodation;- There is a hotel called ‘The Bridge’ under the A40M fly-over by the roundabout and again we can only offer, as far as we know anyone who has stayed there, has been happy?? The e-mail address is <bridgehotel@youngs.co.uk> or if you prefer a telephone number of 0208-566-6246. Tables;- These are becoming a bit thin on the ground but at this time they can be hired by anyone and are £35-00 each at a size of 4′ x 2′. To Stomp subscribers and previous hirers they are £22-50 each, however following the 17th September they will be £35-00 to all. A day ticket must be purchased by anyone wishing to hire a table. The address for these is the same as the ticket address printed above. Please ensure you include an S.S.A.E. ANYONE WISHING TO TRADE OR SELL ANYTHING MUST HIRE A TABLE!!!! Auction;- These will/should be listed in the day programme sheet which was very ably put together and very well received by all at the 2015 event. Plus also we hope these may be listed on the web-site? The good news from the 36th Convention was we were able to accept bids for several items, which we had in the vaults for far to long. One of which was a US 45 picture sleeve for Brian’s ‘Love and Mercy’ which probably dates from 1989, this had been signed in ball point and was a superb Auction item. To be fair this clarity of signature was equalled in 2014 when Marilyn was with us and she very kindly donated two ‘Spring’ 45s both of which had been signed by Brian, again in ball point. What was of interest this past Convention was the presence of an ‘LA Light Album’ UK silver disc award, which attracted a lot of admiring glances. In the late 70s Michael and Roy G were both exceptionally well treated by the gentleman who dealt with ‘The Beach Boys’ at C.B.S. and we have a photograph of this chap presenting the group with a silver disc but it has not been certified by the B.P.I. Earlier this month it was learnt all documentation relating to ‘The Beach Boys’ has been returned to America. So we now need to seek the help of Capitol/Universal in California. Also for this year we may have a gold disc for the ‘Best Of The Beach Boys’ which we are pleased to say is a B.P.I. certified disc!! Raffle;- It has become a custom with the raffle prizes in the past few years for all the items in the raffle, to have at least one genuine autograph! However, do please appreciate most or all of these are autographed copies, they are not likely to be originals. However, we feel it can be agreed it has given this attraction some real sparkle, to say the least?? These again will be listed in Geoff Gilborson’s superb programme for the day. Sales in the very capable hands at a price of £1-00 for a strip of five tickets, of Miss Angela ‘Jardine’ Gibbons!! Data Protection Act;- It is believed this originates from 2007 and was yet another modern evil dreamt up by government jobsworths relating to photography. It is your responsibility should you not wish to see your own picture included in the magazine or on the web-site. To avoid having your photograph taken by Brain Clarke, the official event cameraman. If your view is side on or you are in a group photograph then it is believed the D.P.A. does not apply?? Refreshments;- To be honest this aspect of the event has created problems in recent years and is something we have to watch carefully, thus we will need to up-date as time progresses. However, you do need to appreciate it is not permitted to bring in any form of purchased drink into the premises from elsewhere! “Special Guest”!! If there is one aspect of the Conventions which is highly special, then it has to be this part of the day. The list overall has been quite spectacular in every way and to be honest the overall feedback, we have received has been highly impressive. This most marvellous tribute can only have come from the audience and to be specific, David Marks and from 2015 Bobby F and JoJo. Were simply so taken by the warmth of friendship shown towards them, which they comment is not so easily conveyed in America. This years “Special Guest” is of enormous credit to ‘Beach Boys Stomp’ as a number of you will be aware and should this not be the case? It is far better it be told on the day by the Gentleman himself, Mr Alan Boyd, who should be joined, we hope by Mr Mark Linett? Which as explained above is why we have had to make an alteration to the original date. As you will learn or are already aware Alan’s place within ‘The Beach Boys’ story has been of immense credit and he and Mark both deserve a really good attendance to learn of their part in all this. We also hope to include some live music as this is a contribution to the day, Alan would very much like to be a part of? Timetable;- This will follow a similar pattern to 2015 and as is now part of Peter Whitfield’s ‘Stomp Regulations’ is the fifteen minute space between each attraction. Many years ago we were picked up on this, which seemed quite stupid at the time? As it gives everyone time to do whatever, washroom, purchase a drink and all being well you haven’t missed anything. This will be in the ‘Programme of the Day’ and all being well on the web-site?? Mobile Telephones;- As with much of the modern world where consideration towards others has been abandoned, the overwhelming use of the mobile telephone demands containing! So should you wish to use such for either making or receiving a call would you kindly go outside the building, altogether!! due to a regrettable incident of several years ago. Thus use of photographs, audio, video or film of any part of the days proceedings for commercial sale or reward are strictly forbidden. Notice;- THE ORGANIZERS RESERVE THE RIGHT TO MAKE ANY ADJUSTMENTS OR ALTERATIONS TO THE DAYS PROCEEDINGS, THEY MAY DEEM NECESSARY WITHOUT NOTICE! !